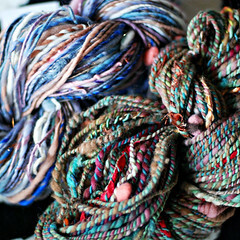 oh and also, i did a holiday swap with my favorite spinner, insubordiknit, and got a bunch of pretty dyed wool and these two skeins of gorgeous yarn! 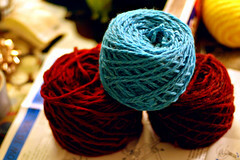 i can’t wait till i have some free knitting time!! 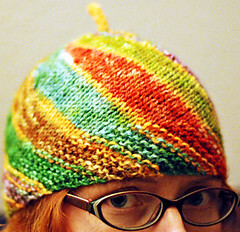 ooh and here’s the hat i knit for pete. 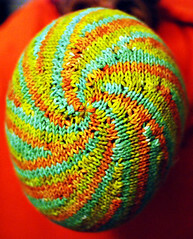 it’s a modified version of my spiraling stripes hat, but with purl ridge spirals instead of color stripes. ok and for a pattern update… i didn’t forget that i had planned to get a couple free patterns posted here by now – the sickness and all the last minute holiday stuff took over, i’m so sorry. one of my new year’s resolutions is to be more regular and reliable with my blog. i shouldn’t make pattern promises i can’t keep. and i should post more often. yes. so right now, i am trying to complete a submission for the spring knitty, which is due on jan.5th. and then i need to put together my samples, due on the 15th (so, mailed out by the 10th). 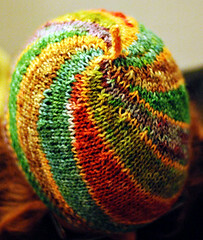 after those are all done, i should be able to get my next free pattern up. so now you know what’s up. whoa i’m back! sorry i kind of disappeared from blog world – i got a horrible cold that lasted 2 weeks because i couldn’t rest to get better due to long hours at the day job… blah… but now i’m just about healthy, have 3 days in a row off (!) and plan to get catching up on all the things i had planned to do before xmas. here’s a quick little post, and then after i get through some emails and stuff i’ll be back on the blog. 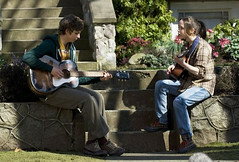 has anyone seen juno yet? we saw it last night, i liked it a lot. the ending scene felt strangely personal to me, since i recorded this song for pete about 2 and a half years ago. i am not a musician, but i wanted to make a song for pete since i loved his songs to me so much, so i learned this super basic easy guitar riff (is that even the right term? riff? i don’t know what i’m talking about…) and then i wrote most of my own lyrics and used a few of my favorite lines from the original song, and recorded it with my internal laptop mic with garage band, so you can hear my hard drive spinning (loudly at the end). so yeah, it’s very silly, but it makes me smile. well crafty wonderland went well! thanks again to susan for letting me share her table! i didn’t have tons of stuff, but i wouldn’t have been able to display more than i had anyway, so it worked out well. 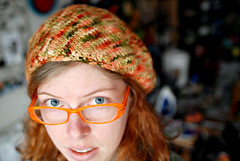 between the scrap bazaar and yesterday, i am almost sold out of hats! 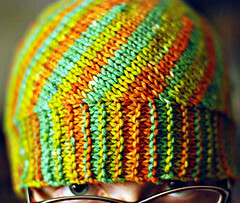 i have one new one that i haven’t posted in my store yet, and then one monster hat and one snake hat. that left one is a wool/alpaca blend, dyed 5 rotating colors, with the red and green on one side and the blue, purple, and orange on the other, so that the stripes will go something like: red, blue, green, purple, red, orange, green, blue, red, purple, green, orange… not necessarily like that, but maybe. i really hope the hat maker shows me her finished hat!! the right one is lambswool dyed 6 shades of green and blue. that one has the dark green on one side, and the 5 different lighter shades rotating on the other side, so the striping with go dark green, shade 1, dark green, shade 2, dark green, shade 3, etc…. this one sold really early on in the crazy crowd, my first thing to sell! i hope she shows me her hat too! 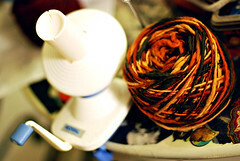 it’s hard dying yarn to sell, i want to keep it all for myself!! oh, if anyone wants anything by xmas – if i get your order within the next day or two i should be able to get it to you by the 25th! oh goodness, so many things going on, so little time to blog… first, i want to tell you i have 5 new 2-color texture hat kits up in my shop. i now give the option to get just the yarn without the pattern – so if you want multiple yarns you aren’t stuck with multiple copies of the same pattern. 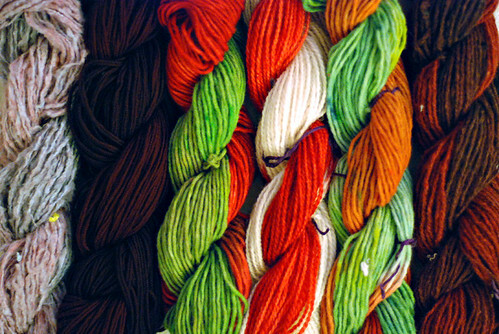 there are 2 holiday colored yarns! 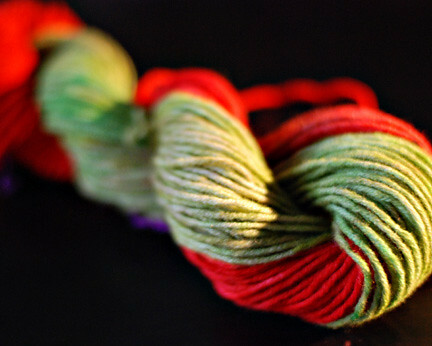 “mistletoe + berries” is a really nice darkish red and green, not too bright, more natural. 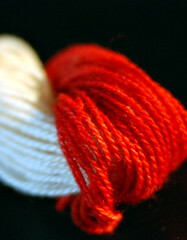 and “candy cane” is dyed red with the other half left undyed. 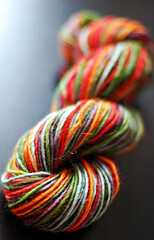 and that last yarn pictured is my personal favorite. 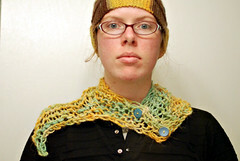 yesterday, i was blogged about on the oregonian’s knitting blog! that was exciting! the scrap bazaar went really super well. i wanted to talk about it more but i’m getting really sleepy, so maybe later when i have photos. and the most exciting news – i’ll be sharing a table with susan beal at crafty wonderland‘s big holiday sale on sunday!! i was pretty sad when i didn’t get in to the event (portland craft competition is tough!) so when she asked me if i’d want to share hers i couldn’t have been happier! ok i just can’t write any more, i’m falling asleep here. sorry for the poorly written post, just wanted to get some info out there. hope everyone’s holiday crafting/shopping/etc is going well!! real quick, then back to work! 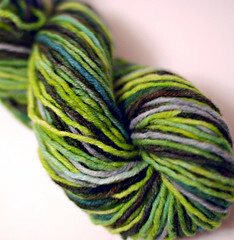 here’s my new yarn for tomorrow! all for the 2-color textured hat kits. of course, i’ll have all the other stuff in my online shop, and zines too! if you’re in pdx, come by scrap and say hi!! ok so i keep wanting to post and i keep not having time and i need to be sleeping so i’ll make this semi-quick for now. first, the reason i’ve been keeping so busy, i’ll be a vendor at the SCRAP bazaar on saturday, which should be a super fun event. everything for sale will be made from mostly recycled materials, and there will be a bake sale too. if you are in the area, definitely stop by! and if i have never met you, introduce yourself, i’d love to meet some of my blog-readers!! 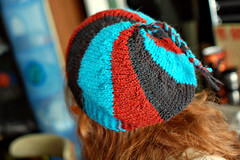 i was shocked to get home tonight and see 3 out of my 4 2-color textured hat kits sold! exciting! but don’t worry if you were interested, there will be many more to come. 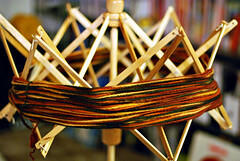 i already have 2 more skeins dyed and ready for saturday, and a couple more planned to be done in time for the bazaar. i will put up whatever doesn’t sell in my store saturday night or sunday. 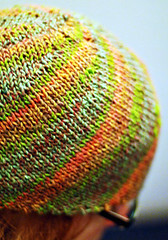 and then i have another hat kit planned to be finished and announced next week! it will be a very cool one, you’ll see! 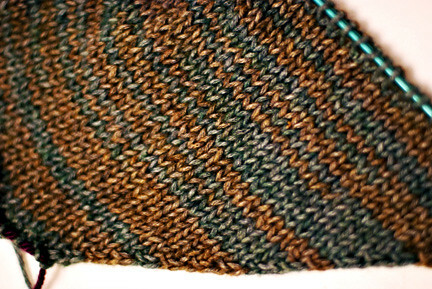 and also, a free blog pattern is in the works for as soon as possible, probably after saturday. just a little last-minute-holiday-gift kind of pattern. 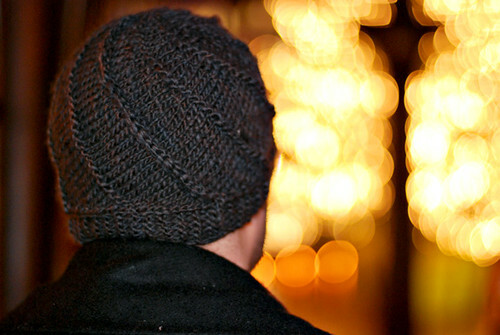 then there is another free hat pattern i keep putting off – i’m thinking that one will be kind of a christmas present to you, very close to the 25th. i have gift crafting to worry about too ya know! 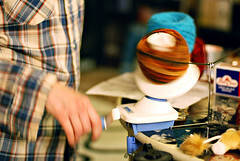 i’m going to see debbie stoller at powell’s tomorrow (wednesday) night – any portland knitters planning to be there? 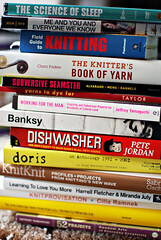 i’m kind of excited, i’ve never been to a knitting book event, gosh i love powell’s. on a completely random unrelated-to-anything note… pete is going to be playing keyboards in a guitar-center-employees band at their company holiday party sunday night, for their beaverton vs clackamas battle of the store bands. they are playing journey’s “separate ways” and he just showed me the original music video. i just had to tell you, if you’ve never seen this video and you feel like laughing nice and hard, i recommend it. oh goodness. so funny. oh yeah i did have one other thing i wanted to mention. 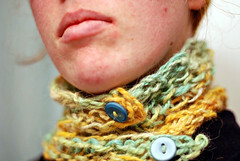 i’m thinking about doing neckwarmer knit kits with smaller amounts (like 40-50 yards) of fancier yarn, or a couple different yarns for stranded knitting. i made this to try out the idea, but it’s kinda weird. so i guess i’m just wondering if there is any interest in the whole concept… the kits would have a more unique pattern like this one and a much more simple pattern option, and would come with the buttons too. i hope everyone is having fun this season and not stressing too much about gift making/buying. and try to buy handmade, of course! yay!